Choose a good cut of premium beef for this dish. If cooking for two, one thick steak is a better choice than two thin ones. The steak may pan-seared or broiled. The French often serve it bleu — extremely rare — but my preference is for rare or medium-rare meat, both of which go meltingly with the sauce. The following recipe is for two people. Begin by making the béarnaise sauce. Keep the sauce warm while preparing the steak. 1 thick steak weighing about one pound (450 g.): rib-eye, Porterhouse, sirloin, filet, etc. Make sure the steak is dry before beginning to cook it. Use paper towels to blot away any liquid. If pan-searing the steak, bring the oil or butter to sizzling over high heat in a large frying pan. Sear a thick steak for about 3 minutes per side for rare to medium-rare meat — a minute longer if you like it medium to well-done, and a minute less for very rare meat. You can test for doneness by inserting a fork. If the juices run red, the steak is rare; if they run pink, the steak is medium-rare. If they run clear, it is well done. If broiling the steak, preheat the broiler, omit the oil or butter, and broil for 2-3 minutes per side for medium-rare meat, testing for doneness as described above. Remove the steak to a serving platter and let it rest for a minute before carving it into slices. This may be done in the kitchen or at the table. 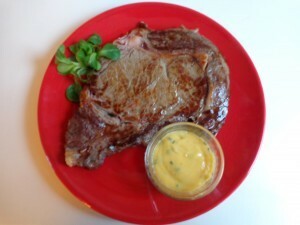 Serve the steak with a small bowl of béarnaise for each person alongside. Serves 2. This dish may be accompanied by any number of vegetables, from French fries or rosemary potatoes to steamed carrots or a gratin. Garnish the plate with dark green leaves — lamb’s lettuce, parsley or watercress — and serve with a fine red wine.